CARACAS (Sputnik) – Venezuelan opposition leader Juan Guaido, who has declared himself an "interim president," refused to detail the sources of $100,000 he used to pay for foreign trips he had taken, as well as opposed the authorities’ decision to ban him from holding public office for 15 years, El Nacional newspaper has reported. "[Amoroso] is not a state comptroller. And the Constituent Assembly does not exist […] The legitimate parliament is the only structure mandated to appoint a state comptroller", Guaido said in a speech in front of his supporters on Thursday. The restrictions were imposed on Guaido on Thursday. Venezuelan State Comptroller Elvis Amoroso said they had been based on irregularities on Guaido's financial records, including the fact that the opposition leader had carried out over 90 foreign trips, paying around 300 million bolivars (around $100,000) for them. Amoroso noted that the sources of these funds were unclear. In January, Guaido, backed by the United States, declared himself the interim president of Venezuela after disputing President Nicolas Maduro’s re-election last May. Washington immediately endorsed Guaido, calling on Maduro to step down. 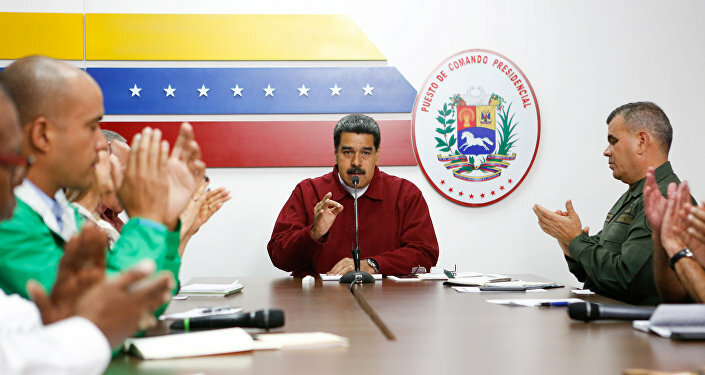 Maduro has accused the United States of trying to orchestrate a coup in order to install Guaido as a puppet leader beholden to Washington. Russia, China, Cuba, Bolivia, Turkey and a number of other countries have voiced their support for constitutionally elected Maduro as the only legitimate president of Venezuela. After the political crisis broke out in Venezuela in late January, the United States has imposed several rounds of sanctions against Venezuelan officials and entities and blocked $7 billion in assets belonging to PDVSA. Maduro has denounced the sanctions as an illegal attempt to seize Venezuela’s sovereign assets. The Venezuelan government has also decided to relocate PDVSA office from Lisbon to Moscow and open a subsidiary in Russia.